This post will teach you everything you need to know about microblading supplies including how to find the best supplies to help improve the quality of your work and get you the best results with your clients! Learn more about which supplies you NEED to get started with right away to build your own at home microblading kit. As a microblading artist you know that the quality of your results is the most important thing. Getting the best results for your clients will result in more word of mouth referrals which will help build your business. Part of getting the best results means that you need to have the right supplies and part of that means you need to know WHICH supplies to get! Have you ever noticed that some microbladers have amazing pictures while others aren't so great? Did you ever wonder their secret? While their technique is no doubt playing a role, there is also another important element to getting awesome results and that has to do with their supplies. Not only will these supplies help you get more referrals they will also make your job MUCH easier. Have you ever switched tools while working on a project at home to something brand new? Or what about how it feels to cut with an old dull knife in the kitchen compared to a brand new and sharpened knife? This list of supplies will give you all of the information that you need to get the best microblading supplies to help you build your business. These are the same supplies that I personally use and I can vouch that they work great! Below you will find a list of 20 microblading supplies including why it's worth spending the money on these supplies. Part of being a business owner is investing in yourself, and part of that is having the confidence to know that you can do an amazing job. Quick Tip: Whenever possible try to get your supplies from Amazon. Purchasing from amazon protects you as the buyer and you can almost always get prime shipping (free 2 day shipping) which means you can get your supplies QUICKLY. You will eventually run out of some supplies for silly reasons but if you can get them back within a few days it will make all the difference. By far the 3 most important aspects for getting high quality results include your pigment, your blades and your lighting (for pictures). High quality pigment will help you to produce the most natural brows for your clients and will help your brows look clear and crisp. I recommend getting pigment from Li pigment which you can purchase from this store. High quality blades will help your brows look neat, fresh and help reduce the amount of time you spend on each client. I didn't appreciate the quality of my blades at first and until I started using higher quality blades. Purchasing high quality blades will add to your "overhead" but it will be worth it in the end because of the result. I most commonly use #7, #12 and #14 blades depending on the client. The first is because of comfort. You can purchase 3 to 4 inch thick beds which provide superior comfort to your clients. Your clients will appreciate it because they may be laying down on whatever bed you choose for hours and hours while you work. The last thing you want your clients to say is that they didn't enjoy the experience. You'll appreciate the ability to move your bed around and not have it locked in place. The third benefit is utility! 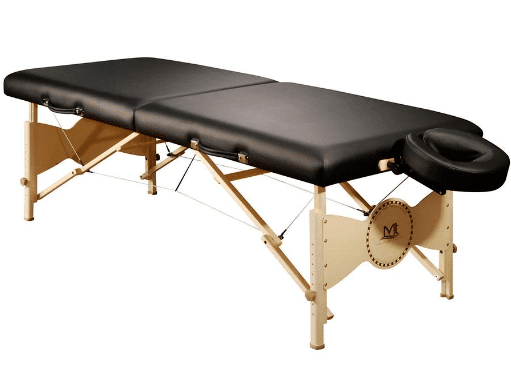 Portable massage beds can be used for many other purposes. Beyond their utility they can also travel easily and can be hidden away to make room for other events. I use this type of bed and I absolutely LOVE it. Adjustable lighting is all about you! You need to have proper working conditions to help you stay calm and collected and to prevent frustration while you work with your clients. Sometimes it can be difficult to get the right lighting, but having an adjustable overhead light can really help to illuminate all aspects of your clients face and brows. I started with 1 adjustable light and then eventually moved to two, 1 on each side and I love it. You can also get a magnifier attachment for your overhead lighting which can help improve your visual field as you work. I would at the very least start with one if you don't have one already. I like this one because it is sturdy, easy to move and has a powerful light. The ring light is another amazing tool that all serious microbladers should consider. The ring light is a light fixture that provides consistent lighting to the face of your clients. It banishes shadowing and perfectly illuminates all facial aspects perfectly. When I first started microblading I was using other light sources like from my adjustable overhead lighting but they didn't provide anywhere near the same clarity that ring lights provide. If you start poking around you will find that almost all professional microbladers use some sort of ring light to enhance their before and after photos and this is critical to your success. Because your before and afters are a way to show your skills to prospective clients! And we all know that a poor camera or poor lighting may diminish the real results that your clients are experiencing. Because of this it's so important that you actually showcase your results. Quick Tip: You'll know if someone else is using a ring light for their before and afters because you can spot a perfect ring of white light in the eyes of the client. This is something that you will want even if you are an experienced microblader (if you haven't done at least 50 clients). Artificial skin pads allow for you to enhance your skills through practice! Remember that in order to stay at the top of your game and in order to always be ahead of the curve you need to be practicing. I recommend that you consistently practice your strokes and shaping for at least the first 50 clients that you do. Practicing at night, and on a consistent basis, will help you be the best microblader you can be. Barrier film is a quick and cheap way to enhance the numbing benefit from numbing cream. Numbing cream is considered a fat soluble substance which means that it takes a LONG time to absorb into the skin. You can increase the rate that the numbing cream is absorbed into the skin by occluding the skin over the numbing cream. This helps increase the temperature and enhances absorption of the numbing cream. This process should dramatically reduce the pain that your clients experience! Another strategy is to apply heat (like from the clients hand) to the barrier which will also increase the absorption rate further. When using barrier cream just make sure to apply a small amount over your numbing cream (but don't cover their eyes, mouth or nose in the process!) and leave it on for 20-25 minutes. Microbrushes may not be the most fun supply that you need but they are still very important. Microbrushes help you apply ointment, move around pigment, clean up the brows and serve as a helpful tool. The pen is important (but in my opinion not as important as your blade). Make sure that the manuel pen that you use feels comfortable in your hand and is something that you will be able to handle for hours on end. It's like finding the right type of "body" to a pen or a pencil. Everyone has their favorite type and kind. I use the Tinkle Razor as a way to clean up the brows before I do any microblading. Cleaning up the brows before you work on them allows for greater vision and a cleaner canvas to work with. The tinkle razor is basically a razor blade with a handle which allows you to get rid of whispy and very fine eyebrow hairs that don't follow the regular eyebrow flow. My clients love it because I will then give them the Tinkle razor that I used on them so they can keep up with the maintenance. You can purchase 12 for around $7-8 so it doesn't add much to your overhead. I LOVE them and I'm sure you will too. Some microbladers go without numbing cream and for the life of me I can't understand why. Numbing cream helps DRAMATICALLY reduce the pain that your clients experience and will therefore increase their COMFORT during the procedure. The more comfortable they are the more likely they are to leave a positive review and tell their friends about you! Perhaps one of the reasons that many artists don't use numbing cream is because they believe it's only available with a prescription. That's actually not the case. You can get high quality numbing creams over the counter (at least in the US). For best results I recommend using a lidocaine based numbing gel/cream like the product below. When using it make sure to apply it, then occlude it with the barrier cream and let it sit for 20-30 minutes (depending on the client). If you can get a prescription for Lidocaine, Tetracaine and epinephrine then you should - but this may cost a lot of money and not be available to everyone. I always recommend that microbladers learn to shape and create their own brows just with symmetry and their artistic skills. Having said that sometimes a stencil can provide a perfect template for difficult clients, especially for those who don't have an existing set of brows to follow. Just remember to not rely 100% on stencils because then your brows will NOT match the face of your client. They can be a great tool but you don't want to use them as a handicap or else your technique may suffer over time. Nothing fancy here, but they are still very important. Getting gloves will help protect you AND reduce the risk of infection in your clients. It's also important that you have an extra box of latex free gloves (if you don't already) in addition to a regular set of box gloves. Never run out of these! Pigment rings simply help reduce the time it takes you to finish a client and add convenience to the whole process. If you aren't familiar with what they are you place the pigment that you are using on your finger and wear it like a ring. This helps reduce the time it takes to go back to your tray to get more pigment during the microblading process. Sharps containers help keep everything clean and safe for both you and your clients! You should be safely and properly discarding your sharps into a hard box container known as a sharps container. This is to prevent puncture of a regular box or trash can and will help reduce the spread of disease. Sharps containers are required if you are dealing with needles, scalpels and anything that is sharp that directly enters the skin. Measuring calipers help you to keep your brows from looking wonky and asymmetrical! If you did a training you should have received some in your kit, if you didn't then make sure you get one below. Brow scissors help you clean up the brows (like the Tinkle razor) before you start microblading. Make sure you get a nice pair to help with thicker brows and stray hairs. Biohazard bags, like sharps containers, simply help you keep a clean and safe work environment. Pretty much everything that isn't a sharp object will go into your biohazard bags. So if you are using 2x2's or 4x4's to wipe blood away from the brows then you want to place those in the Biohazard bags and then dispose of them properly. You don't want to leave bloody objects floating around your tray and leave them next to sharp objects which can puncture through bags, gloves and into your skin! You don't necessarily need to have a Mannequin head unless you are still learning and growing as an artist. The mannequin head allows you to continue practicing (which you will need for at least your first 50 clients) on a more "life-like" object. It's still important to practice on measuring tape and drawing out your brows, but you miss out on the 3 dimensional aspect of a real face if you stick to 2 dimensional practice objects. Getting a mannequin head will help give your practicing a more "life-like" experience and help you grow as an artist. You can also use measuring tape and place them on the mannequin to help you with the shaping process. It's so important that you have confidence in yourself and in your ability! If you don't it will show in your consultations and in your work. Part of having that confidence is knowing that you have a complete microblading kit so that you are prepared for anything that could possibly come up during your microblading session. You should expect to spend around $1,500 or $2,000 on these high quality supplies to help get you started. The good news is that you don't necessarily need to invest in everything right up front. In addition you should be able to pay back your investment within just a few months of microblading. I recommend that you do start with investing in high quality ring lights and lighting to help you get before and after photo's because this will help you grow your business the most. But I want to hear from you too! Which are your favorite supplies? How are you getting awesome before and after pictures? Leave your comments or questions below and I will do my best to answer them! Does Microblading Leave Scars or Keloids? Hi! I'm Kat and I write these posts. I'm obsessed with eyebrows, hair and anything related to fitness. Right now I do microblading, 3d brows and semi-permanent eyebrows in Mesa, Arizona as a certified microblading artist. I'm a licensed cosmetologist and have been for over 10 years as well. I love experimenting with new products and love to share my experiences. Have questions? Leave them below! What Exactly are Enzymes & What do They do for your Skin? browsandbody.com is a participant in the Amazon Services LLC Associates Program, an affiliate advertising program designed to provide a means for sites to earn advertising fees by advertising and linking to Amazon.com.